If we learned one thing about the men’s soccer team this weekend, it’s that they are their own worst enemy. Facing the University of Northern BC Timberwolves, the second-ranked Canada West team going into the weekend, all the stats pointed to a fairly straightforward two wins for the T-Birds. 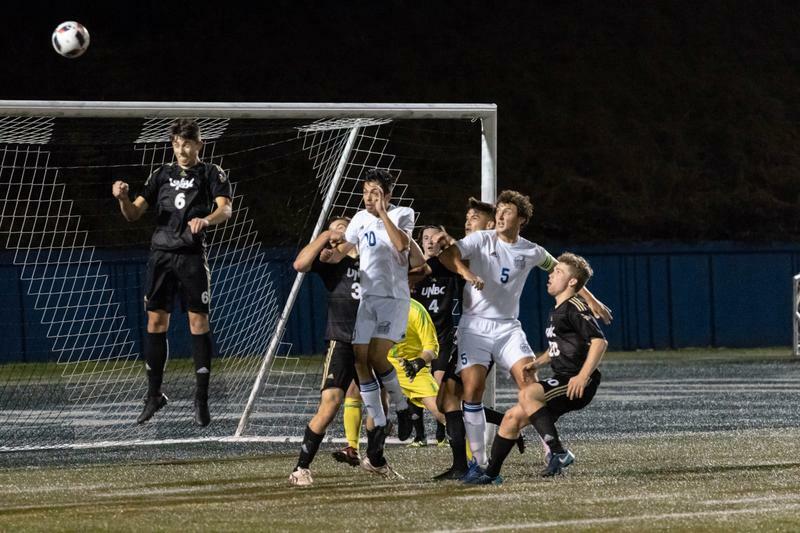 While the Timberwolves were heavily reliant on on their star striker Francesco Bartolillo, UBC had more depth than UNBC and a plethora of goal-scorers to choose from. On Sunday, that difference was entirely evident. With three goals in five minutes, UBC coasted to an awe-inspiring 7-0 win over the Timberwolves, spearheaded by a four goal performance from second-year Kristian Yli-Hietanen — the second UBC player after Niall Cousens to reach the four-goal game milestone since 2013. Set-play specialist and key central midfielder Thomas Gardner got on the board yet again, as he continued to impress in the middle of the park. With five goals so far this season, his name will no doubt be on the shortlist for rookie of the year. Goals from winger Zach Verhoven and central defender Connor Guilherme only solidified the fact that the team intimidates across the board. It was an absolute mauling of what is a decent team in their division. But, just two days earlier, UBC looked like a different team — uninspired, uncoordinated and uncomposed. Yes, they salvaged a 1-1 tie with a goal from last year’s leading goal-scorer Victory Shumbusho who came off the bench. Yes, they still dominated possession and it was evident that they had the stronger individual players, but they did not perform as a unit. A strong defensive performance from the visiting Timberwolves seemed to kill any creativity UBC usually has in switching the ball across the park. Subtract Thomas Gardner from the central midfielder trio, add in an unnecessary red card from Caleb Clarke, and UBC was a much different team. Their cohesion going from the attack to defense was not up to their usual standard, and with frustration mounting throughout the match, errors snuck in. Late in the first, UNBC’s Bartolillo was left unattended to put in their only goal of the game and it was an uphill battle for the ’Birds from there. It’s a game they will most likely hope to forget, and with a seven-goal massacre less than 48 hours later, it would be easy to leave the 1-1 game behind. But if the ’Birds hope to challenge for the national title this year, those lessons could be vital. Working out the depth and rotation of the midfield trio to support, but perhaps more importantly survive without Gardner (if ever needed), will keep the entire roster more in sync and confident. Up front, perhaps it’s time to start giving other strikers a share in the fun. If Sunday proved anything, it’s that Yli-Hietanen is up for the game when called upon, as are other attacking players like Verhoven, Mackenzie Cole, Nick Fussell, Sean Einarsson and even outside-back Daniel Kaiser — all put in some good work on the attack. With it being a Legends Cup match up against the University of Victoria Vikes this coming weekend, this might be the perfect chance for other players to earn their starting spot. There’s nothing like a rivalry match to bring out the best in players.